C3® International, Inc. will submit an insurance claim for reimbursement from your insurance company. Once you complete the Pharmacy Process, simply email a copy of the front and back of your insurance card and your Prescription for Idrasil™ to Service@IdrasilRx.com and direct C3® to submit your claim on your behalf. (sorry – No MediCare, MediCal or Kaiser currently accepted). C3® will contact you with the result of your submission. Should your claim be denied, C3® will assist you to appeal your claim. If you need more information or assistance with this process please contact Patient Services. Is Idrasil™ reimbursable by a patient’s medical insurance? Yes. Idrasil™ is reimbursable by private insurance, HMO or better MediCaid, No MediCal, no Kaiser. How does the patient submit the insurance claim? 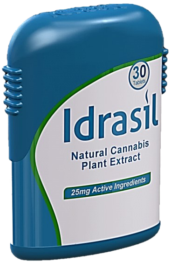 Simply write the patient a prescription for “Idrasil 25mg, PRN / Qd” on the doctor’s prescription pad and give it to the patient. The Patient will then, if they have not already, Become A Member with C3®, supply their information (Prescription etc, and C3® will Submit the Insurance Claim for them.